Lake Ladoga is the largest freshwater lake in Europe. Visitors can also visit a 14th-century monastery built on Valaam Island in the north of the lake. The lake is a perfect destination for fishing, hiking, biking, rock climbing, and sailing. Mandroga is located on the river Svir, which connects the Onega and Ladoga lakes. This beautiful waterfront village has been constructed in the traditional Russian wooden architectural style. The village is known for the vodka museum. Traditional spirits are brewed here so while learning the history of the vodka industry, visitors can sip on some of the finest vodka in the world. Svir River is in northeastern Leningrad Oblast, Russia. It provides a waterway between two of the largest lakes in the area, Lake Onega and Lake Ladoga in Europe. Kizhi Island is home to one of the first open-air museums in Russia. Developed in the late 1940’s, Kizhi’s architectural ensemble now boasts 74 monuments in the collection. Here, wooden building have been constructed to provide a glimpse of centuries gone by. Kizhi is also thought to be one of the most ancient inhabited sites in Russia. Recent archarchaeological excavations carried out within the museum area have resulted in the discovery of traces of ancient settlements and pagan ritual sites. On the banks of the Sheksna River in Goritsy sits the remains of the Nunnery of the Resurrection. Goritsky is also a great example of Russian rural life. lake Rybinsk is one of the largest man-made lakes in the world. 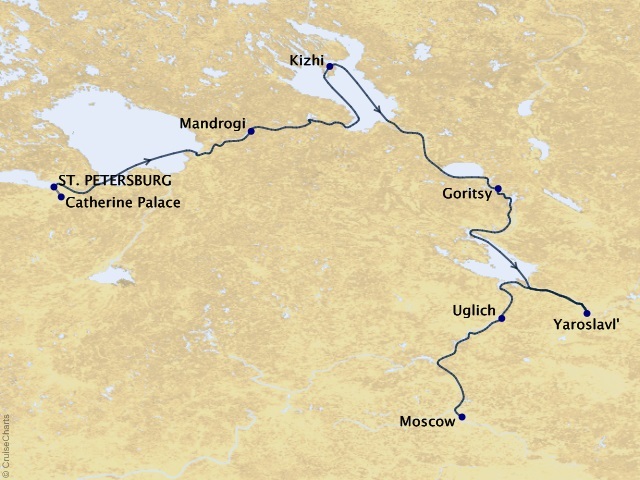 Recreational opportunities include hunting in the surrounding forests, boating on the expansive Rybinsk Sea and fishing along the islands, channels and bays that form along the waterway. Dozens of fish species can be found in the Rybinsk Reservoir, including large zander, bream, and small pike-perch. Yaroslavl is a Russian treasure. Its wooded areas are filled with animals, birds, babbling brooks and streams and charming glades. Wonder through the white birch trees and the contrasting coral bunches of ashberry trees, taking in the fragrant air. Aside from the natural beauty of the region, the town is filled with ancient churches and fortresses. Among them are the Church of the Prophet Elijah, best known for the frescoes painted by well known Kostrom masters, Guri Nikitin and Sila Savin. Uglich is best known as the town where Prince Dmitri, son of Ivan the Terrible, was murdered. The wooden house in which the Prince occupied and the Church of St. Demetrius memorialize this historic event. Uglich is also home to many churches, monasteries, museums and other historic monuments that will keep visitors busy for days. Moscow is the capital of Russia and its political, scientific, historical, architectural and business centre, from which power and might of the Russian state developed. Moscow is the barometer and nucleus of the changes sweeping through Russia. Nowhere are Russia's contrasts more apparent than here - ancient monasteries and ultra-modern monoliths stand side by side, and New Russian millionaires and poverty-stricken pensioners walk the same streets. Moscow's history lies in layers. In the Kremlin, for instance, both Ivan the Terrible and Stalin orchestrated their terrors; Napoleon watched Moscow burn; Lenin fashioned the dictatorship of the proletariat; Kruschev directed the cold war and Gorbachev unleashed perestroika.